Private collection, Switzerland, by whom acquired from the above in 1972. Acquired from the above by the present owner in 1987. L. Piccioni & A. Ceroni, I dipinti di Modigliani, Milan, 1970, no. 88 (illustrated p. 92; titled 'Uomo con cappello', dated '1915'). J. Lanthemann, Modigliani, Catalogue raisonné, Sa vie, son Oeuvre complet, son art, Barcelona, 1970, no. 194, p. 120 (illustrated p. 211; dated '1917'). Paris, Galerie Charpentier, Cent Tableaux de Modigliani, 1958. New York, Hirsch & Adler, 1972. Paris, Musée du Luxembourg, Modigliani L'ange au visage grave, October 2002 - March 2003, no. 45, p. 238 (illustrated p. 239; titled 'Portrait of a Man with Hat (José Pacheco? )'); this exhibition later travelled to Milan, Palazzo Reale, March - July 2003. 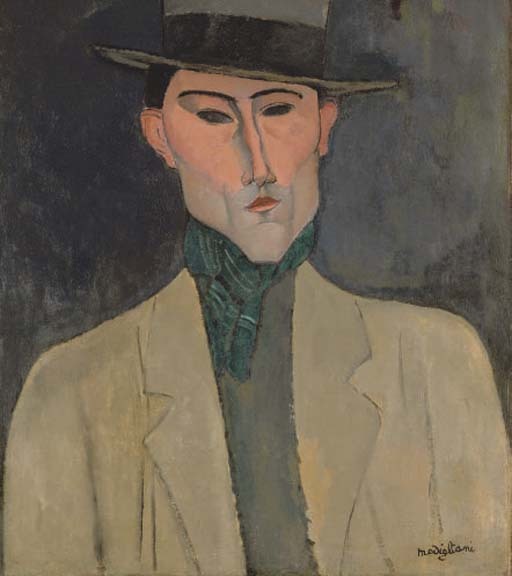 In Homme au chapeau, the almost planar means with which Modigliani has rendered the facial features is distinctly sculptural, a characteristic that marked many of his paintings from the period immediately after he abandoned working in stone in 1915 and that has led to this picture being ascribed a date from that period. For Modigliani, sculpture had been a vocation, and yet his health meant that he was physically unable to withstand the level of exertion that work in stone-- the only sculptural medium that he truly believed in-- demanded from him. He returned, then, to painting, but his experiences as a sculptor came to flavour his work, giving them their unique sense of modelling-- a factor that is so vividly evident in the face of the Homme au chapeau. These characteristics would come to result in the increasing sense of accomplishment and therefore the consequent popularity of his pictures from the period. Modigliani's portraits often introduce this sculptural sense of the three-dimensional to the face, but deliberately suppress it in the rest of the painting. In Homme au chapeau, this is clear both in the dark background and also in the clothes that he is wearing. This flatness contrasts heavily with the finely modelled face, an effect that is heightened by the difference that exists even in terms of the textures of the paint in the various areas. Where the lines of the jacket are marked with simplicity, those of the face have been carefully applied with an acute appreciation of the modulation of tone. This is especially evident in the depiction of the subject's nose, where thin, sharp lines have been used to evoke perfectly the shape and form. In addition, the deft manipulation of shade, in the lower half of the face, shows us that the sitter's face is inclined and somewhat unshaven. 'Cézanne's faces, like the beautiful statues of antiquity, have no gaze. Mine, on the other hand, do gaze. They gaze, even where I have decided not to paint any pupils; but, like the faces of Cézanne, they express nothing but a mute concord with life' (Modigliani, quoted in W. Schmalenbach, 'The Portraits,' pp. 33-51, Modigliani: The Melancholy Angel, exh.cat., London & Paris, 2002, p. 35). In Homme au chapeau, this gaze is clear in the dark eyes which, despite the lack of differentiation between white, iris and pupil, are far from sightless. Instead, they appear as wells of infinite character, the spirit of the person seeping through, defying the flesh-mask. At the same time, these dark eyes serve to hold the viewer's own gaze, creating a sense of engagement and interaction between us and the subject on the canvas. The slightly rough, unshaven look of this smooth man, combined with the dashingly-worn hat and the deliberate lack of tie visible beneath the scarf, adds an air of rakishness and non-conformism to the Homme au chapeau that implies that he himself would be perfectly suited to the atmosphere of Modigliani's notoriously hedonistic life in Paris. The date of circa 1915 places Homme au chapeau at the height of Modigliani's most legendary Parisian phase, the period of drunkenness, of occasional poverty and occasional but all-too-soon dissipated wealth, of flaming rows with the journalist and occultist Beatrice Hastings... It was during this period that many of the legends of the scandalous artist of Montparnasse had their origins. Hastings herself, reflecting upon the combination of notorious behaviour and immense charm, described him as, 'the spoilt child of the quarter, enfant, sometimes terrible, but always forgiven' (Beatrice Hastings, quoted in J. Rose, Modigliani: The Pure Bohemian, London, 1990, p. 106). The hat in Homme au chapeau appears possibly Iberian, perhaps helping to support the suggested identification of the subject as José Pacheco, a Portuguese painter who was active in Paris during the early part of the 1910s. Pacheco was involved in the same circles as Modigliani and they became friends, as well as having many other acquaintances in common, not least among whom was Amadeo de Souza Cardoso, another artist and a firm friend of Modigliani's. Pacheco, on his arrival in Paris, appears to have taken on Cardoso's space in the Cité Falguière, an agglomeration of buildings and studios that was the refuge and haunt of many impoverished artists, not least Modigliani himself. It was here that many of the friendships and alliances that were to form the foundations of many of the movements at the dawn of modern art were forged. Cardoso himself had met Modigliani in the Cité Falguière. When Pacheco moved into his space, it was being vacated because, following his marriage, Cardoso had taken on a much vaster space at 3 rue du Colonel Combes. Cardoso had an entire floor in this building, and took advantage of it to use it to host an exhibition of his own works. At this point, Modigliani was focussing on his sculptures, and Cardoso offered to share this show with him. Modigliani therefore exhibited a significant group of his stone heads and caryatids. While many of the visitors to this exhibition would come to be recognised as the pioneers of their generation, for example Picasso and Apollinaire, there was no critical reception-- at all and no sales. Pacheco himself returned to his native Portugal as Europe teetered on the brink of the First World War. There, he founded a monthly publication called Contemporânea as well as the literary magazine and movement Orpheu with the celebrated writer Fernando Pessoa who despite writing only a small amount under his own name, had numerous pseudonyms, the combined force and output of which made him a significant one-man force in the introduction of avant-garde literature to Portugal.